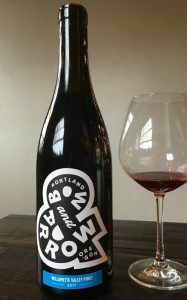 2017 Bow & Arrow, Pinot Noir, Willamette Valley, Oregon. Crafted from selected vineyard sites, mostly organic or biodynamic the Bow & Arrow Willamette Valley Pinot Noir is always a bright and delicious natural expression with fresh fruit detail and mineral charms. Scott Frank, owner and winemaker at Portland’s Loire Valley inspired Bow & Arrow is making some stylish wines and his 2016 and 2017 offerings are some of his best yet, this is a winery to discover for value and for the authentic character of each wine, especially Frank’s Gamay based wines, but his series of Pinot Noir(s) are not to be overlooked, especially this regional blend that way out performs for the price. Frank wants to make humble wines and since moving here from New York in 2001, he has explored the Willamette looking for unique vineyards and varietals to make wine from in his place in Portland, with Loire Valley grape varieties like Melon, Chenin Blanc, and Gamay that were planted in the Willamette Valley decades ago, being of special interest to him, along with Pinot Noir, some of which he uses in a signature blend with Gamay called Rhinestones as well as Cabernet Franc, Cabernet Sauvignon that he blends in a small amount into a Franc based wine like they do in Anjou (Air Guitar) plus a Sauvignon Blanc that he does in a Pouilly-Fume style, aged in used French Oak. Bow & Arrow goes for mostly neutral wood, native ferments and ultra low SO2, all to make as Frank puts it, humble country wines that are easy to drink and easy on the wallet, but these are also serious and can be exceptional. Scott got his winemaking stripes at the legendary Cameron Winery under the guidance of Joh Paul, who helped Frank really get a feel for the region and the underlying soils that make this area so special. This Willamette Valley 2017 Pinot is super tangy juicy with loads of wild strawberry, cranberry and tart cherry fruits along with brisk orange rind, red apple skin and cinnamon spice, it is vibrant and almost electric on the lighter framed palate, it is very lifted and crunchy adding tea notes, chalk dust and floral tones with air. Best with a slight chill and certainly with food, this 2017 should fill out over time, but will not ever be as ripe and lush as the 2015 and 2016 vintages, though it is much more in line with what Scott is after in this little wine, as he is looking to craft a Glou Glou wine with this bottling. Mission complete with this easy quaffer, as it delivers eye popping energy and zest, very much in the modern natural wine mode, and it’s a fun picnic and or bistro wine that plays easily with Spring and Summer cuisine, fans of light reds with gripping acidity will love this edition, drink over the next 2 to 3 years.